3 Ways White Paint Will Easily Beautify Your Home — KTJ Design Co.
As the cooler days approach us here in California, I’ve got a craving for a good Manhattan. I like it with Crown Royal whisky and a Maraschino cherry. It is a cocktail that should be savored slowly as each sip warms your body, beginning at your forehead and culminating at the tips of your fingers and toes. As I sip, I anticipate the plump cherry marinating in the whiskey and the idea of popping it in my month creates a sense of excitement. This is how I feel about these no-fail paint colors for white walls. I go back to them over and over in my design projects. I begin by fanning out the large paint deck, thinking I need to pick new and exciting palettes, but I always fall back on these tried and true colors. Imagine coming home at the end of a long day, pouring yourself a Manhattan, and drinking it slowly as it relaxes the tension in your neck. That is how these paint colors will make your home feel - smooth and approachable. Now and then, we will pick one vibrant color as an accent wall to be the cherry on top when we design your space, but for now let’s concentrate on the whisky and vermouth. Do White Walls Work with Every Design Style? Isn’t white boring? Bland? Sterile? No, not at all. 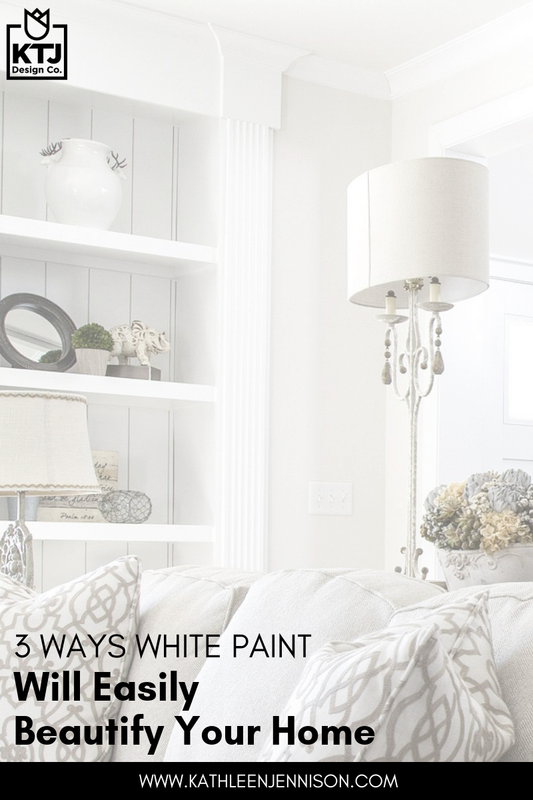 We typically suggest painting all the rooms in your house the same color: White. ● White walls heighten the awareness of every element in your room. If you crave bold swatches of color, simply bring it in with bright fabrics and decor. ● White walls are a brilliant backdrop to display oversized and colorful artwork for a dramatic impact (think art gallery). ● White walls coupled with bright accessories like rugs, cushions, blinds, candles and vases dramatically change a room and can easily adjust with the seasons. Paint the trim and doors a slightly darker hue of white. Did you notice that in the graphic? No, I didn’t get it backwards. Just because we have been told to paint the doors, trim, baseboards, and molding a stark white, you might assume that is the only way. Well, I’m asking you to think outside the box with this one. Painting the doors, trim and baseboards a slightly darker hue of white will make your room feel anchored and harmonious. Next, paint the crown moldings and ceiling the same color as the walls. This will make your room feel like it is floating. If you paint the crown molding and ceiling white, your eyes will abruptly stop at the ceiling (a screeching halt is not good for your soul). Whereas if you paint the walls, crown molding, and ceiling all the same color, the eye will float up and over the ceiling and doesn’t even notice the height or different plane. Many a homeowner has balked at the notion, but when they trust me, they are so happy with the results. If you are dying for a bright paint color (because I know there are so many colors and you just want to use one of them), paint an accent wall. The best places for an accent wall include the fireplace wall, the wall that anchors your bed or sofa, an interesting nook, or a bookcase wall (but remember to paint the sides of the bookcase, too). 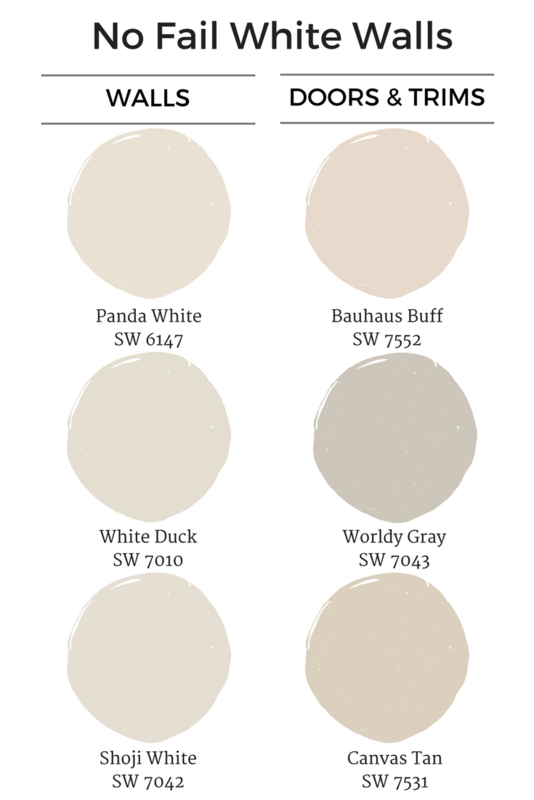 Need Help Choosing the Right Shade of White or a New Accent Color?